Novelty sleeping bags are a great way to add a little fun to bedtime whether it is in a tent on a campout or in the living room during a sleep over. With so many great designs to choose from, there is sure to be something for every child or child at heart. Novelty bags are great for kids or even adults who enjoy adding some whimsy to their lives. Typically, these bags have fun prints or are shaped into unusual designs. They can feature cartoon characters or a favorite activity. One thing that they all have in common is fun. If you are planning a rustic family camping trip you might prefer children's down filled sleeping bags to keep your children toasty warm at night. For a summer backyard campout or a living room slumber party however, they'll love a novelty bag that is just their size and easy to tote anywhere. There are a few things to consider when shopping for a novelty sleeping bag. Size-novelty bags can be found for infants through teens so know what size you have before you make your purchase. Choosing the right size will make it easier for the child to carry as well as being more comfortable to sleep in. Extra features-some bags have a built in pillow so a child doesn't have too much to carry. Others have an attached inflatable mattress to ensure comfort no matter where it is set up. Still others come with a drawstring bag or carry-case to make toting less of a task for little ones. Easy care-look for a bag that is machine washable and dryable. Choose from characters like Dora the Explorer, Thomas the Tank, Disney's Cars, Princesses or cute animals. A convenient foot pump inflates the mattress and the cover is machine washable. eBags carries so many stylish prints, you'll want to collect them! A coordinating pillow is included and each bag is reversible and machine washable. Even better is the fact that eBags offers a 90 day warranty as well as their 110 percent price plus guarantee. 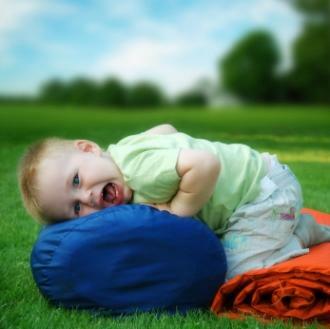 Domestic Bin children's sleeping bags will give your child sweet dreams at dream prices for parents. They have a large selection of characters, and themes like dinosaurs, barnyard animals, NFL, NASCAR, Lego and much more. All sleeping bags are easy care and easy on the pocketbook. Fussbudget carries bags that range from simple to extravagant. Choose from personalized and designer sleeping bags to funky, character shaped bags and more. This is a fun place to shop. Shoppers in the United Kingdom will love the Snooze Shop. They carry Snuggle Sacs in a variety of styles that are sure to please even the pickiest child (and parent). Little People's Cove has sleeping bags that are machine washable and include a built in carry case and a sewn in pillow. Sizes range from toddler to teen so you can meet everyone's needs in one place. This is by no means an exhaustive list. If somehow you were unable to find a suitable bag from this list, you can find many more online that will cater to your imagination.